At studioJLA we are always exploring ways to improve our design and creative process and providing our clients with the visual tools to better understand of our vision for their project. In recent years, the traditional model has been replaced with 3d animation and perspectives which has transformed the visual experience and ability to resolve our design at all angles. However with advances in 3d printing technology, we wanted to see if the physical model could reshape or add to our creative and design process. How has it added to our design process ? We think so. We have found clients able to connect with the 3d models which gives an overall view of the design and another way to appreciate the design and its form. The high level of detail which can be incorporated into the 3d models allows our clients to get a good appreciation of the spaces and the internal elements such as the furniture and joinery. With the majority of our projects we are involved with the management of the development application process. We believe ultimately the purpose of the development control guidelines and planning instruments are essentially there to promote good design and planning. With every project, each site brings their own unique qualities such as views, natural topography and existing constraints. There are times a variation to the design guidelines maybe necessary to achieve a better outcome for both our client and their adjoiining neighbours. In order to consider variations from the various planning instruments, we think it is important to be transparent and visually demonstrate its impact. For instance, some councils have side building envelope control to manage the bulk and scale of a proposal, a solution that may breech this control yet have a larger setback in certain sections in order to achieve a better outcome for both the client and the adjoining neighbours. A good example is in high density areas with poor orientation often requires a special attention to adjoining windows which may require solar access reviewed on a hourly basis at various times of the year and internal solar access analysis. A good example is a our Queens Park house which the side setback follows the existing line of the side setback on the northern boundary which does not comply with Waverley Council requirements. However the southern side setback is larger to improve the amenities to the neighbouring property. The end result is a solution that satisfies our clients requirements yet protects the solar access to its neighbours. 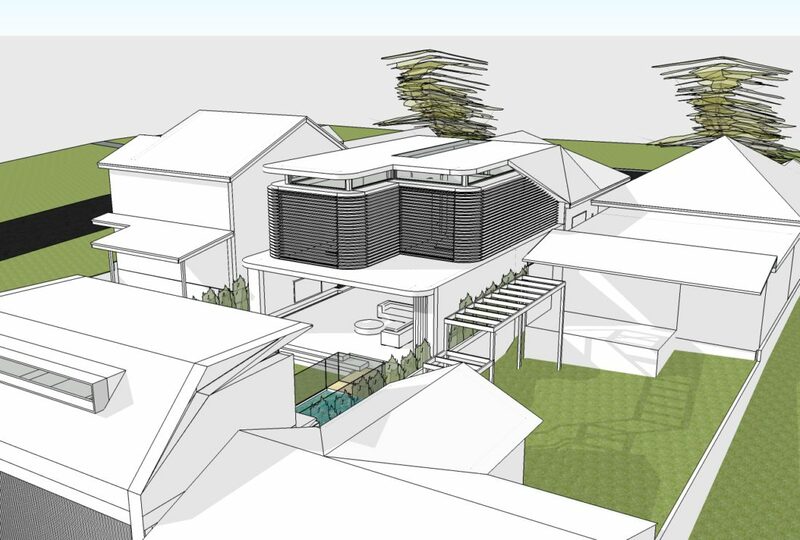 We are in the process of finalising the design for our residence in Eastwood. The design is a reflection of a close collaboration between owner and architect to achieve a design that celebrates both it’s form and function. The angular layout is in response to an easement which dissects the property at approximately 45 degree angle. The design aims to express the layout into the various forms and architectural elements to provide its client with a comfortable yet an inspiring home for the family. Much like an artwork, time was taken to explore the various ideas to ensure all design elements read in harmony with one another with the expression of the spaces reflected both inside and out. We like to thank Nicole England for taking the time to shoot our residence in Henley. The extension which includes reconfiguration of an kitchen and dining area and the addition of a sun room illustrates minor extensions can transform a space. 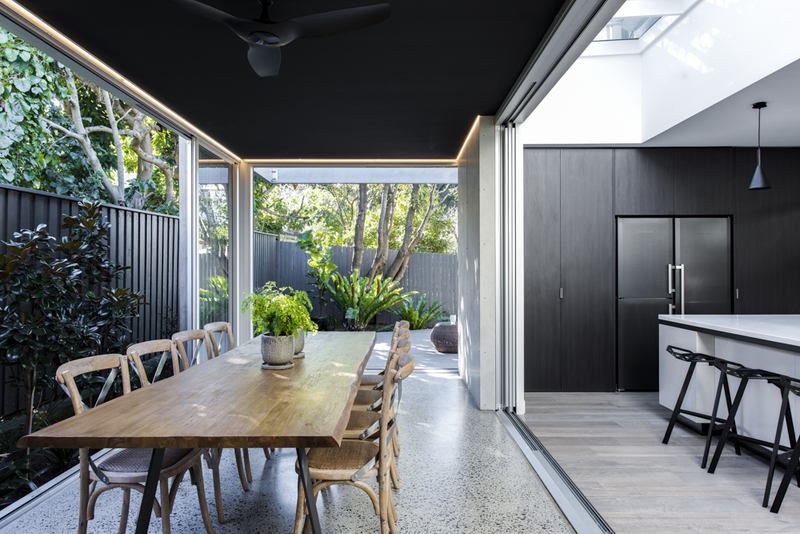 The extension includes a sun room with a cascading bi-stacking doors to allow the space to be used a both an enclosed or outdoor space. We look forward to seeing Nicole’s photos over the coming weeks.